Mantis Cranes have a Self Erecting Tower Crane in Upton currently, a Potain T85 the largest Pedestrian Operated Tower available on our hire. Our client is currently complete a residential development project at High Street, Upton in Northamptonshire. At the outset planning was granted for Construction of 12 flats with associated landscaping, access and parking works. The Self Erecting Crane went on site in August and has been helping out on the project since then. The maximum load of the crane is 6,000kg close to the tower and it can provide a maximum lift of 1,250kg at the end of the 45m jib. 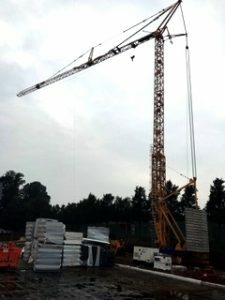 The particular crane has been erected to provide a Height Under Hook of 34.2m for the duration of the crane hire period.